Organization is an uphill battle in our house. We’ve tried charts, checklists, storage solutions, room reorgs, consequences, and rewards. A few years ago, a particularly pernicious string of forgotten assignments and lost belongings signaled that it was time for a new game plan. While searching for fresh ideas, I stumbled across a National Institutes of Mental Health study that reports relatively late maturation and prolonged growth of the prefrontal cortex—the area of the brain responsible for a host of executive functions, including focusing attention, planning and forming strategies—in kids with high IQs. However, a subsequent study by researchers from Stanford University and the University of Penn suggests that this delayed cortical maturation, “cognition without control,” allows for greater creativity and flexibility of thought. How could we leverage that creativity to accommodate for still-developing organizational skills? I thought about my daughter’s love of building and recalled a New York Times article a few years earlier about the Museum of Boston’s Engineering is Elementary® program. Enter the engineering design process. Re-casting the organization issue as a design challenge allowed my (then) 8-year-old to view it from a more productive, problem-solving perspective. With a little inspiration from NASA’s super-cool, super-short Intro to Engineering video and a free, downloadable “You are the Engineer” poster from The Works Museum for guidance, O eagerly took the lead in designing a solution. After some online research, she devised a small, color-coded reminder list to post on her desktop at school, with her teacher’s consent. A week or so later, we discussed whether the solution was working. O tweaked her list and swapped out the original version. The following year, we turned to the engineering design process for another challenge: careless math errors. As a math-mad kid, O was particularly prone to rushing through easy assignments, particularly when it freed up more class time for independent reading. This time, I kickstarted the effort. A quick Google query turned up a grad school report by Andrea Wiens, who fortuitously chose to investigate careless errors made by her seventh-grade math students. Wiens’ lit search led her to all kinds of information about types of careless errors and why they occur. Most notably, she found that students’ confidence in their ability was negatively correlated with the amount of time spent on math tasks. In other words, the more confident a student is, the less time she spends on problems. Bingo. 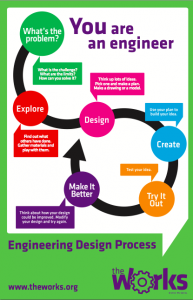 An engineering design process graphic created for students and educators by The Works Museum. Perhaps because of her confidence, O didn’t seem to be terribly bothered by her lackluster performance. But I suspected that she was underestimating the frequency and cost of her carelessness. Having recently learned to calculate percentages, O began correcting and tracking her scores on assignments. We also read through key sections of the report together. O completed Wiens’ post-project survey with a recent assignment in hand so that she could review her work and respond with accuracy. She was able to identify the various types of careless errors she was most prone to making: skipping problems, basic computation errors, not showing work and not reading or following directions. When O had scored poorly on assignments that I knew she was capable of acing, I’d chalk it up to carelessness, channel my frustration into a brief lecture, allow her to make the corrections and move on. Frankly, I needed to get out of the driver’s seat. For O to own this process, she wanted to correct her own work. So, we instituted a firm 90% or better rule: She had to score a minimum of 90% on an assignment to advance, regardless of whether her mistakes were careless or not. Assignments scoring below 90% required additional review, without judgment and for however long was necessary to get it right. For someone who detests repeating material she’s already grasped, it was a great motivator for focused effort. Once again, O had to think about her own thinking to devise an effective solution. Based on her previous success and a list of prompts Wiens had provided to her students, O designed the “Right Guide,” a brief checklist to grab her attention and compel her to follow-through with the necessary, albeit tedious, tasks. In the first week, the frequency of careless homework errors dropped from an initial high of 7 to 1 or fewer per assignment. By scoring and tracking her own performance, O evaluated the impact of the solution she designed herself. That sense of achievement motivated her to stick with it and get back on track when she fell back into old habits. Since then, the engineering design process has become part of O’s repertoire of problem-solving strategies. She says that it’s given her a more organized approach for tackling projects and staying focused on refining solutions, which has been particularly helpful as her endeavors have grown more complex. Last winter, O’s motivation began to flag after working doggedly on a massive, personal project for nearly a year. Procuring supplies had been time-consuming and costly, causing production to grind to a halt for weeks. As a result, progress had become frustratingly incremental. The idea that her work process was worth documenting was incredibly validating for O. While waiting for a new shipment of materials to arrive, she retrospectively documented the first ten months of the project with invoices, photos and and a list of references. Once building resumed, O narrated project development as it unfolded. She was diligent about everything from the selection of her writing instrument to the description of lessons learned at the end of each work session. As a reference tool, the notebook enabled her to resume her build from where she’d left off: All she needed to do was review the previous session’s notes. It also provided her with perspective on how much progress she had made. Renewed excitement propelled her to finish the project, develop a pitch presentation, build a project website, and submit her work to a design competition. Obviously, the engineering design process isn’t the best approach to every problem. But for us, it has been a fun, productive way to engage my creative kid in thinking about her thinking and designing solutions for her own real-life challenges.